Was your home, place of business, or investment property constructed over forty years ago and you are currently experiencing problems with the sewer system? Perhaps the toilets are flushing slower than usual and clog extremely easily. Maybe the water is not draining quite right in the sinks, shower, or tub, or puddles have been forming in the yard or grounds and it has not rained recently. Have you smelled sewer gas in or around your residential, commercial, or industrial real estate? These are all signs that a major situation is brewing underground in the sewer pipeline. Although the pipe manufacturers had the intent to make a product that would stand the test of time the materials available back then are significantly substandard when compared to the high-tech products produced in this day and age. At one point cast iron was the sewer pipe material of choice. We now know that cast iron rusts and rots when exposed to water for long periods of time. Wastewater not only travels through sewer pipes on a daily basis, but the pipes are buried in the earth where they are exposed to groundwater. The combination causes the sewer pipes to rot from the inside out. Eventually, cast iron was replaced with a clay tile material. Kiln-fired clay does not rust, rot, or corrode when exposed to water. In fact, it is basically waterproof. The problem is that it chips, cracks, and breaks extremely easily. This is not a good situation for sewer pipes that are buried in the ground and must be able to withstand the natural shifts and movement in the earth. No matter the type of sewer pipes you currently have or the reason for them breaking down it is imperative to have it fixed before a sewer related disaster strikes. 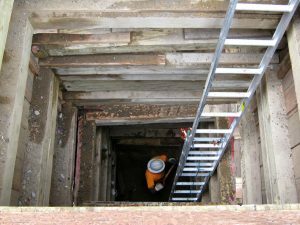 In the past, the traditional excavation sewer repair method was the only choice for property owners in the St. Peters, Missouri area. It requires a long and deep trench in order to physically expose the sewer pipeline for repair or replacement. The trench destroys any landscaping and hardscaping that is located on the ground level above the buried sewer pipes. By the time the trench is excavated, the sewer pipeline is fixed or removed and replaced, and the trench is filled back in with dirt it can take upwards of two weeks or more. The good news is that the trenchless sewer repair approach, particularly the Nu Flow pipe lining procedure relies on advances in plumbing technology as opposed to trenches. The bottom line is that the sewer pipes do not need to be physically exposed in order to fix them. High-tech equipment and materials replace all of that. The entire trenchless sewer repair process can be completed in as little as one day from start to finish, lasts for well over one hundred years, and is approximately fifty-percent more cost-effective. Sewer repair does not need to be the costly, time consuming, and destructive process that it once was. Nu Flow Technologies is a trenchless sewer repair expert that actually helped develop the industry. We are here to get the job done the right way for you.